The Cube that moves the world. 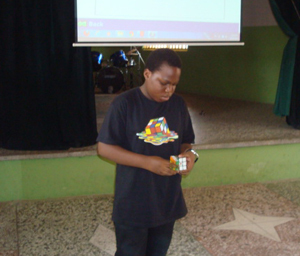 Rubik’s Cube has the power to captivate, to fascinate, to challenge people. So much more than merely a toy, Rubik’s Cube is a classic. In a success story spanning three decades, it has inspired fashion and other designers, artists, mathematicians, and millions of cubers from Alaska to New Zealand. The perfect marriage of fine form and flawless function, this magical cube is a modern-day style icon. Born in 1974, it was the brainchild of inventor Ernö Rubik, who needed a tool with which he could teach spatial thinking to design students. The idea came to him in spring of ’74; he had the cube in his hands by fall. It first swept his native Hungary, and then the rest of the planet. By the early ’80s, a fifth of the world’s population had already had the pleasure of cubing. The second wave comes with the Internet. Today millions of websites, blogs, and YouTube clips are all about cubing. It has inspired all kinds of creative minds in architecture, music, fashion, advertising, film, and theater. Rubik’s Cube appeals to everyone. If you see it, you want to touch it, turn it, twist it. This puzzle is so compelling we can’t help but want to solve it. And it’s so self-explanatory, there’s nothing to learn. Simple, yet sophisticated, Rubik’s Cube is a refreshingly real brain-teaser. Today so many of us spend so much time dealing with virtual reality at work and at play, we’re delighted when we come across a hands-on challenge we can actually touch. Brainpower, creativity, perseverance, and a sound strategy – that’s what it takes to solve the cube. Like in life, if you bring all this to challenge, chances are you will succeed. The magic conjured by this cube makes it one of the most interesting and most attractive advertising tools of our time!